The lungs are paired organs of respiration. They are covered by the visceral layer of pleura except at its attachment to the mediastinum (the HILUM) through which vessels, nerves and airways enter at the root of the lung. The lungs both have an apex superiorly and base inferiorly. The left lung has two lobes, upper and lower, divided by the oblique fissure. The upper part of the right lung is instead divided into an upper and middle by the horizontal fissure. The fissures are formed by invaginations of the pleural surface. Each lobe is divided into 2 – 5 segments by fibrous tissue, each serviced by a segmental bronchus and each functioning as an independent unit. The segmental bronchi continue to divide (into subsegmental bronchi and so on); losing their cartilage and becoming bronchioles once their diameter falls under 1 mm. The medistinal surface faces the mediastinum and includes the hilum. The mediastinal surface is indented by the heart; this is significantly greater on the left than the right. The diaphragmatic surface faces the diaphragm inferiorly to form the base of the lung. The anterior border separates the anterior aspect of the costal and medistinal surfaces. The posterior border separates the posterior aspect of the costal and medistinal surfaces. The inferior border separates the costal and medistinal surfaces from the diaphragmatic surface. The lungs attach to the mediastinum at the hilum, which also serves as the point of reflection for the pleura. The hilum contains the vessels, nerves and airways that supply each lung. In each hilum, the pulmonary veins are anterior and inferior. On the right, the descending bronchus intermedius forms most of the posterior part; whereas on the left the dividing left main bronchus is centrally located on the posterior aspect. The pulmonary arteries fill the remaining space; on the left they are superior and posterior; on the right they are superior, between the bronchus intermedius and the pulmonary veins. The costal surface is related to the visceral and parietal pleura, and the chest wall (ribs, muscles, skin). The mediastinal surface of the right lung is in relation to the inferior vena cava (above) and the heart (below). The oesophagus and azygos vein lie more posteriorly. The mediastinal surface of the left lung is in relation to the end of the arch of aorta and the descending aorta, which leave a significant contour on the surface. The heart lies anterior and leaves a large impression on the lung. The diaphragmatic surfaces of each lung are in relation to the diaphragm and underlying structures; on the right this is the liver whereas on the left it includes the spleen and stomach. The visceral pleura is closely attached to the underlying lung tissue and is unable to be removed easily. The lung surface therefore has a shiny appearance, with a polygonal pattern caused by the attachment of underlying lobules. Its colour is age dependent - at birth the lungs are pink, but with ongoing inhalation of carbon the lungs become darker and mottled. The lung is highly elastic and shrinks upon removal from the thorax. The cut surface of the lung has a fine spongy, reticular pattern with similar colouring to the surface. The surface of the lung is covered with fibrous, elastic connective tissue which is firmly adherent to the overlying visceral pleura. The functional parts of the lung are the alveoli; this is where gas exchange between the air and the blood is facilitated. The alveoli are microscopic air sacs surrounded by thin walls. The walls are covered with epithelium which overly the thin connective tissue and vascular structures within. Type I pneumocytes are terminally differentiated squamous cells which are involved in gas exchange with the underlying capillaries. Type II pneumocytes are cuboidal and have more functions. They secrete surfactant (which allows the lung to remain expanded) and may also enter the cell cycle to create new pneumocytes. The connective tissues within the wall consist of endothelial cells forming capillaries, and fibrocytes/blasts which create the elastic matrix. Macrophages may be present within the alveolar spaces, where they are involved in clearing debris that is not collected by the bronchial tree. Once satiated, they migrate up to the bronchi to be expelled. The alveoli are vital for the exchange of oxygen and carbon dioxide between the air and the blood. The thin walls between these two 'spaces' allows gases to diffuse easily. Air must be moved in and out of the lungs for replacement of the gas within the alveolus. Humans usually take between 12-16 breaths per minute, although this may vary with illness. This lung movement has major implications for the delivery of radiation treatment. Inspiration, when air is drawn into the lungs, occurs when the respiratory muscles expand the thoracic cavity. During quiet respiration, the lung volume typically changes by 20% during the breathing cycle. This is accomplished by contraction of the diaphragm, which expands the thoracic cavity supero-inferiorly, and the intercostal muscles which expand the thoracic cage laterally and antero-posteriorly. In forced inspiration, further lung expansion is possible. During quiet breathing, expiration is passive and occurs as the chest wall and diaphragm return to their resting position. Active expiration involves other muscles of ventilation. Studies examining lung motion have either examined the lobes of the lung, a tumour within the lung, or neighbouring structures such as the diaphragm. The conclusions reached by these studies are that there are no general patterns of respiratory movement that can assumed for a particular patient. Usually, movement is greatest in a superior-inferior direction, with some lateral and antero-posterior movements due to action of the intercostals. Movement ranges from nil to over 30 mm for lung tumours on the SI directions, and up to 24 mm in AP or lateral directions. 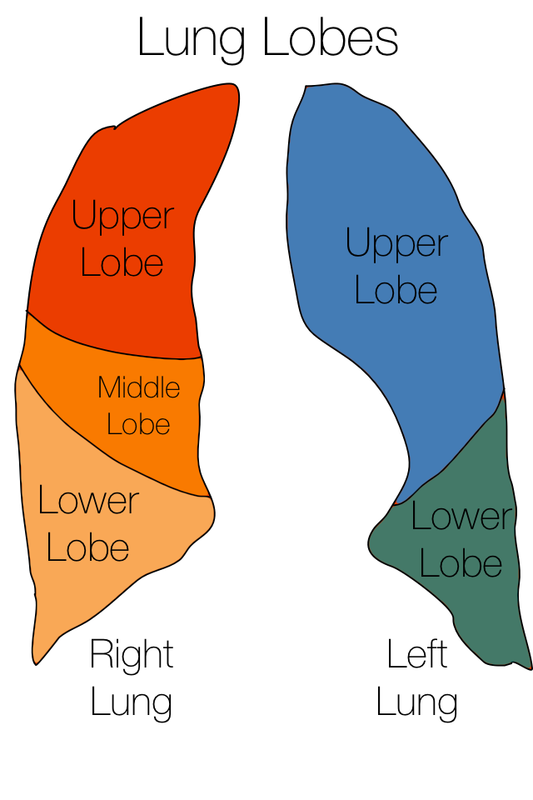 The lower lobes move more than the upper lobes (mean 18.5 mm vs 7.5 mm in one study). Finally, the motion of the tumour during inspiration is not identical to the path taken during expiration, known as hysteresis. The addition of a respiratory gating system that detects respiratory motion, delivering dose when the thorax is within guidelines set prior to treatment commencing. Use of PET scanning, and fusion with the treatment planning system. A PET scan is acquired over several minutes, and if the target is moving with respiration, it will appear as a blurred region on the scan. The lungs are afflicted by numerous disease, the most prevalent of which is smoking. Smoking causes chronic inflammation within the lung, which can lead to destruction of alveoli (emphysema) and/or narrowing of bronchi/bronchioles (chronic bronchitis). These changes are known as chronic obstructive pulmonary disease (COPD). Lungs that are affected by COPD may be less tolerant of further scarring induced by radiation. The lungs are unique in their vascular supply as they receive unoxygenated blood. Blood from the heart is directed to the pulmonary trunk, which divides into the two pulmonary arteries. These arteries follow a similar branching pattern to the bronchi, accompanying them as they divide into lobar and segmental bronchi. The arteries are typically found anterior to the their associated bronchus. They continue branching and terminate as capillaries in the walls of the alveoli. A supply of oxygenated blood is derived from the paired bronchial arteries. These arteries arise from the descending aorta, the right being longer than the left as it travels across the carina to the right main bronchus. These arteries supply oxygenated blood to the parts of the lung that receive minimal oxygen - the main and segmental bronchi. There is evidence that they may accompany the bronchi to the surface of the lung, where they contribute to supply of the visceral pleura. Oxygenated blood from the alveolar capillaries is collected into veins, which combine to form the larger pulmonary veins. Each lobe of the lung is drained by a pulmonary vein; the upper and middle lobe veins of the right lung unite to form a superior pulmonary vein. The veins all empty into the left atrium. Importantly, in the segments of the lung, the veins do not accompany the artery and bronchus, but instead run in the segmental boundaries. The bronchial veins are much smaller, and drain blood from the regions supplied by the bronchial arteries. The left vein drains into the hemiazygos vein, which then crosses behind the carina to empty into the azygos vein and thereby the superior vena cava. The right bronchial vein drains directly into the azygos vein. The lymphatics of the lung are of considerable importance in oncology. Lymphatic vessels travel in superficial or deep plexuses. The superficial plexus lies just beneath the pleura, whereas the deep plexus accompanies the bronchi. The deep plexus may be associated with intrapulmonary lymph nodes, often at the junction of two bronchi. These are named for the level of the junction: interlobar (at the union of the lobar bronchi), lobar (along the lobar bronchi), segmental and subsegmental. The superficial plexus usually has no nodes. The two plexuses combine at the hilum, where tracheobronchial nodes are located (station 10R/10L). In general, lymph will pass to superior tracheobronchial nodes from the upper lobes, and to the inferior tracheobronchial nodes from the lower lobes, but there are anastamoses between the lymphatic channels which may cause unexpected spread. Lymph from the left superior tracheobronchial nodes will tend to ascend through the mediastinum on the left; those from the left inferior tracheobronchial nodes tends to pass beneath the carina to ascend on the right side with the lymphatics from the right lung. The mediastinal lymph nodes are discussed in more detail here. The lungs and visceral pleura are exclusively supplied by the right and left pulmonary plexus. This is a collection of branching nerves which lie on both sides of the hilum. Sympathetic fibres are sourced from the paravertebral sympathetic ganglia, and bronchodilate, vasoconstrict and reduce secretion of mucous glands in the bronchi. Parasympathetic fibres are derived from the vagus nerve (X) as it descends through the mediastinum. These fibres bronchoconstrict, vasodilate and increase mucous secretion. The local invasion of lung tumours partly depends on their origin within the lung. Tumours located in the periphery may invade into the pleura, causing an effusion. Further growth can lead to chest wall invasion with neuropathic pain from intercostal nerve involvement. Central tumours may invade into the heart, oesophagus, mediastinum and/or great vessels. This can lead to syndromes such as superior vena cava obstruction, although this is more commonly due to nodal disease in the mediastinum. As discussed above, lymphatic spread of the right lung and left lower lobe tends to spread superiorly through the mediastinum in paratracheal nodes. Left upper lobe tumours will usually spread to the right paratracheal nodes. Lung tumours have particular preference for bony, adrenal and brain metastasis if spreading haematogenously. Lung cancer is the most common cause of secondary brain metastases.